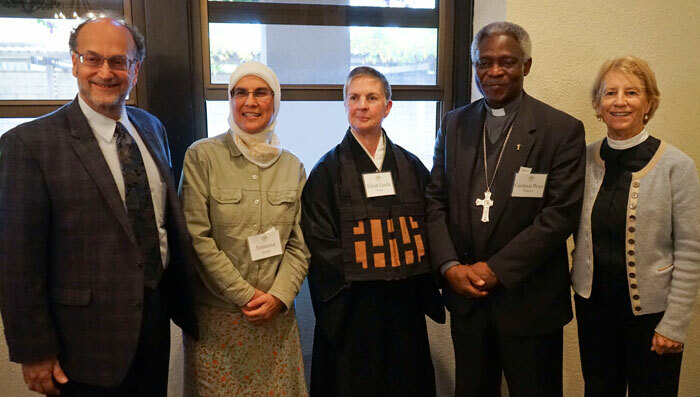 Interfaith panel (L-R): Rabbi Allan Berkowitz, executive director of Environmental Volunteers; Ameena Jandali, co-founder and content manager of Islamic Network Group; Cardinal Peter Turkson, a Ghanian cardinal who is president of the Pontifical Council for Justice and Peace; Abbess Eijun Linda Cutts; and Rev. Canon Sally Bingham, the president and founder of Interfaith Power and Light. Cardinal Turkson, the keynote speaker for the conference, is widely acknowledged as one of the most influential Vatican experts on the content of the historic encyclical “Laudato Si,” which focuses on the environment and the crisis of climate change. Less than two weeks from now, world leaders will gather for a UN climate summit on November 30 in Paris�a city suddenly and forever changed by another kind of global crisis on Friday, November 13. For the SFZC sangha, as for people around the world, last week�s news of violent terrorist attacks weighs heavily on our hearts. Yesterday evening�s memorial service at City Center was dedicated to the victims in Paris and Beirut, and a similar service took place at Green Dragon Temple (Green Gulch) as well. These tragedies serve as painful reminders of the inconceivably vast and varied suffering that surrounds us in all directions. The abbatial leadership and all the sangha join together in expressing our deep sorrow at the violence, war and cruelty occurring throughout the world. The horrific terrorist attacks in Paris are heartbreaking�and yet we cannot forget the similar suicide bombings a day earlier in Beirut. We remember the Russian plane crash in Egypt, new wars emerging in Burundi, the continuing civil war in Syria with thousands killed, displaced and fleeing as the refugee and migrant crisis grows. And because violence comes in many forms, we think of instances of the continuing racial inequality in this country, exemplified by shootings, and unrest at the University of Missouri and other schools. During this time of giving thanks and generosity, let us open our hearts and minds to include all those affected by these recent events�victims and those who have perpetrated these acts�all who share with us this fragile earth in its beauty and its pain in myriad forms. May all beings find freedom from suffering and the causes of suffering.